Hey guys, so I didn’t see a thread about this outside the one listing the WF manufacturers so I figured I can start a new thread asking this. So in terms of scaling up, all I hear about WF’s is that their speed is far faster than a short path(depending on the size of the WF). However the downside is the oil will almost always need to be ran through multiple times. Besides that, I keep hearing that a WF cannot take on crude unless it’s been vigorously winterized/decarbed/carbon scrubbed/de gummed. In other words you did everything you possibly could to remove the gunk from your crude. And from what I heard, this is the only kind of crude a WF can take on. Otherwise, anything that’s got a fair amount of fats and lipids and other gunk will make a WF perform poorly. Is this true? Can WF’s take on “normal” crude or can they only run through perfectly prepared crude? The oil does not need to be run multiple times, at all. I always get high 90s cannabinoids on the first pass. So for speed it is a big winner. As far as crude preparation, it must be decarbed or else you’ll get bad results. You can run it unwinterized and I don’t think it’s even slower, but the end result will be opaque and waxy (but this happens with short path as well). I find carbon scrubbing offers some benefit to efficiency and odor, but it isn’t essential. Degumming made no positive difference and I don’t do it anymore. All these things are easy to implement, and a decarb + winterization you should really do for any type of distillate. I am agree on what MagisterChemist just said. Wipe Film is the only option you have if you are running more than 10kg of crude a day. Speed is the king right now. I just set up a wipe film in Oakland,CA. They now can run 50kg of crude oil each day, and they use to run 5kg for each day. After the setup, they run all the crude that I hold in my have in half day. Yes, you need few more step before you put crude oil into wipe film. But those step require little attention and can be done in large quantity. Let me know if you need any suggestion or question on picking a wipe film. I see a lot of scam online right now. 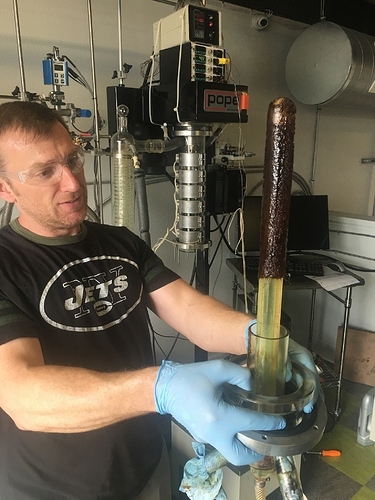 @MagisterChemist and @jimmytian8 I toured a lab today that has a massive supercritical CO2 extraction setup and they plan on running the product (decarbed biomass prior to SFE) from that unwinterized through a dual 6" pope WFE system. They said it can handle the waxy material as is… is this true? Would this produce distillate with purity >70% that is suitable for crystallization? This has me thinking about alternatives to cryo-ethanol if that actually works! Again, wiped film can “handle” waxy material with no problem at all. It just co-distills the waxes. Waxy in, waxy out. Nothing to do with interfering with the machine’s operation. I’ve done this and i’ve also gotten results well above 70% out. As far as whether the waxes will interfere with crystallization, that is a separate issue unrelated to distillation. 10kg of crude a day, is that is a work day? Or 24 hour period? We have a cheap Chinese WFE that we use, it works fairly well, but our output isn’t anywhere near 10kg in a workday, closer to 5, and is starting to become our production bottleneck. Just wondering if it’s operator error, or just a byproduct of being a knock off Chinese system. you must not be using that Chinese wiper right then! We hit 2-3L/hr output with our dinky chinese wiper, and I can hit 90% TAC in one pass. Also, your crude oil can go in WAYYYYY grosser than any short path, because of the low residency time and the wipers, your garbage just gets pushed out instead of cooked. What vacuum and temps are you using? By one pass are you meaning running through the entire system once? Do you have automatic feed or manual? We have manual, and are adjusting the feel manually to maintain an average vacuum around .02 torr, running it through the system twice, once heads removal, and once tails removal. My gut feeling is we need a diffusion to maintain more consistent vac at a faster feed, but I’m not well versed enough in WFE to really be sure before dropping the $. How about some basic information here. What size of unit do you have? 5kg per day isn’t unreasonable on a 2". Taking us about 10 hours to do a 6kg run of crude. Then yes, you’re doing something very wrong. Please DM me I do wiped film consultation and routinely get high 90%s on first pass. Search for the VTA sop I posted, that’s a good place to start for temps and vacuum levels. I don’t think that’s the only thing going on with that run. I’ve got beautiful results on non-winterized run. If it’s warm ethanol crude, the far larger problem is polar crud, which that looks like to me (and winterization doesn’t always solve). Warm (room temp) ethanol is the worst, as lots of gummy sugars get pulled out, that persist through standard winterization…CO2 crude seemed devoid of these interfering compounds. I have run “dirty” crude through a WF apparatus, and it’s a challenge, to be sure. The entire feed path into the column has to be kept warm enough for the crude to flow without cooling, often requiring liberal application of the heat gun to spots where waxes and such like to hang up, such as pumps, joints with dead space, etc. The worst part, though, is the waste fraction you generate. All your lipids and waxes pass through the column into your receiving vessel, which will never be fully clean again. The only way to remove the stuff is lots of heat and time, and even then it’s not 100%. Be prepared to do a lot of cleaning of glassware as well as the internals of your system itself. 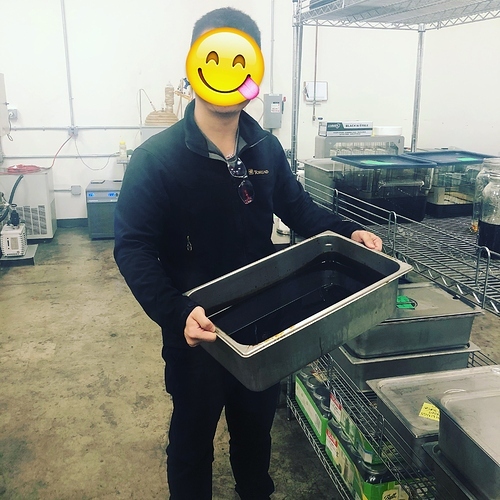 Running less than clean crude can be done, but the effort required is one of the reasons I’m lobbying the guys I work for so hard for equipment and process changes that will give us a cleaner extract and crude. I’ve had succes with warm EtOH crude if winterization was followed by hexane/brine washes, so polars get washed out. Temps were pretty close to what we’ve been running. Only difference is we haven’t been varying the vacuum pressure from first run to second, we’ve been doing both at Max. Will try dialing back the pressure f and see what that does.